Membership: "Chromium Blue,""Clash," Raoul, "Silent Scream"
History: (Captain America Annual I#13) - The Red Skull hired four armored lackeys to accompany him in stealing a tome from the home of a deceased Russian agent. The book apparently contained the secrets of "Der Tag," the secret descriptions for the Nazi doomsday plans. 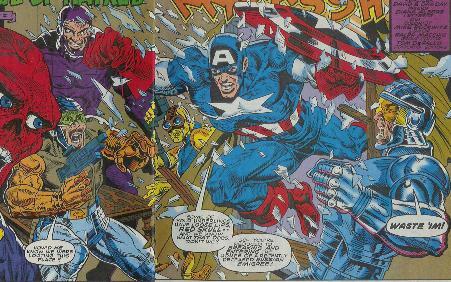 As the quintet were in the Russian's home, they were attacked by Captain America. The Avenger had the upper hand at first, but was hit from behind by Raoul. The Skull gloated about "Der Tag" to his enemy, but escaped quickly as Captain America took out his agents with little effort. Comments: Created by Roy Thomas, Arvell Malcolm Jones, and David and Dan Day. Raoul is the only one named in the story. 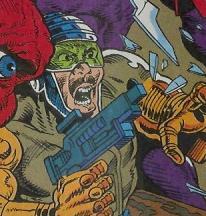 "Chromium Blue" is named due to his armor's color. "Clash" is due to the hideously-colored armor he wears (get it? It clashes?). "Silent Scream" because he never talks. 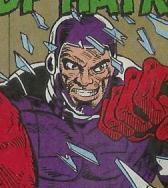 As Captain America burst in on them, Chromium Blue was hit by ricochet fire from Clash's gun that bounced off the Avenger's shield. He regained his footing, but was defeated again by Captain America. Clash managed to accidentally shoot two of his compatriots while aiming for Captain America: First, Chromium Blue, then Raoul, who took a shot to the face when Captain America ducked. He was defeated along with the others. Raoul's suit was equipped with metal knuckles. He managed to take down Captain America and held him while the Red Skull gained the book containing the secrets of "Der Tag." He was shot in the face by Clash on accident. 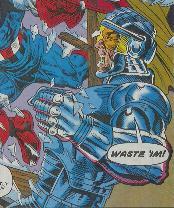 Silent Scream helped catch Captain America, but was defeated by him when the Avenger threw him into a wall.